Since we're down to only two chickens, I've had to use storebought eggs a lot more this year. While I always use free-ranging organic eggs, after reading The Omnivore's Dilemma, I'm not under any impression that they are actually from real free-ranging chickens (as in running around outside, as opposed to simply not being in tightly confined cages). They used to seem just fine, and compared to the anemic, pale and flabby regular white eggs from abused and confined chickens, they're definitely a remarkable step up. But they're still nothing like eggs from our own chickens. 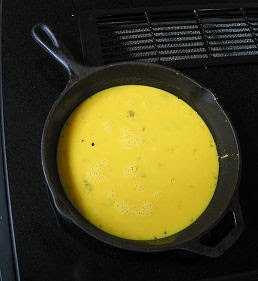 Today I had a few eggs from our own chickens to make this omelette with and wow, look at the color! I wish I'd taken a photo of one from the store eggs because it's so strikingly different. And you can hardly get the yolks from our chicken eggs to collapse, they're so firm you have to poke them repeatedly with a fork. Chickens fed on grass (like our little lawnmowers) have the highest levels of Omega-3s in their eggs, so I'm not surprised our eggs are so lovely. By comparison, the regular mass-produced, production agriculture chicken egg that most Americans buy has an Omega-6 to Omega-3 fatty acid ratio of 20:1. Professional dietitians recommend a ratio of 1:1 and definitely no higher than 4:1, Omega-6 to Omega-3 fatty acids. Now that's scary: 20:1!! These days, with so few chickens, I usually save the eggs from our own ladies for the kids to eat, and do my best to get local eggs (which are hard to find and much in demand) or the "free-range Omega-3" eggs from the store for us adults. Still, I'm really looking forward to the day when we have a big flock of layers again and plentiful beautiful yellow eggs for all of us. 5. I can see in the dark (I was once pulled over for driving at night with no lights on, and I was still wearing my sunglasses) and can hear bats, flourescent lights, and other high-pitched noises. 6. 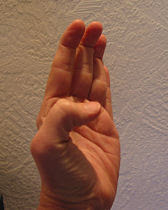 I can bend all of my fingers at the top knuckle only. There are times when many of us drive cars, even those who are very dedicated to non-fossil fuel transportation. Our cities, schedules, lives are not set up to run at the pace in which all of society existed before fossil fuels. This makes it difficult to, say, get from a class on one end of town to an activity on the other end in 15 minutes. And then there are those people who have no intent of getting around in any other way but a car, but are starting to become aware of fossil fuels issues. Climate change is becoming a heavily discussed topic, thanks in no small part to Al Gore's An Inconvenient Truth. Meanwhile, many people who would like to walk or bicycle to work, or take their kids to school in this manner, do not feel that it is safe to do so. 1. Stop at crosswalks for pedestrians. In my state at least, this is defined as any intersection, whether it has a marked crosswalk or not. Many drivers don't know this. However, even when standing with my kids, even at a marked crosswalk, even in a $#%! school crossing zone, at least 75% of the cars zoom on through the crosswalk without slowing down or stopping. 2. If a pedestrian is crossing the street, don't nudge your car forward on their heels. This feels intimidating and downright frightening to pedestrians, and really folks it's not going to get you to your meeting any quicker. Leave home earlier if time is such a big issue that the five nanoseconds you gain from putting a young child's life in danger is that important to you. 3. Give cyclists plenty of room. Many people say they would be more inclined to bicycle for transportation if they felt safer on the roads. Cars crowding cyclists is a recipe for disaster. 4. Remember that a cyclist in most places is entitled to take up a full lane of traffic. We don't often do that, prefering to be as courteous to drivers as we can. Please give us the same courtesy: if you have to wait behind us for a few seconds in a stretch of road where it's too narrow to get past safely, remember that you could be (legally) waiting behind us the entire time. It is our right to the road, same as yours. Taking the time to be courteous and safe with pedestrians and cyclists encourages more people to make use of these transportation methods. Really, I wish everyone who could do so was required to walk or bike at least one trip a week. I think if they took the time to see the world from the perspective of a small body relative to large hurtling chunks of metal, they would be safer and more courteous drivers. If for some reason you can't walk or bike, make sure that the streets and sidewalks are safe for those who do. I was working in the yard yesterday and had let the ladies out to wander around (they're especially happy when I'm raking on the big leaf pile, because they get to poke around for the bugs I stir up.) After awhile, one of them went back in to the nest box to lay, and the other accompanied her in as she often does. Ten minutes later, I had a worried-looking hen (don't ask me how I knew) at my heels, trying to get my attention. As I turned around, she headed back toward the coop, looking over her shoulder in what I swear was a "follow me" expression. So I followed her back down, where she promptly jumped up into the nest box beside her companion and lay her beak on her friend's back. I could hear that the other chicken was making some odd sounds every thirty seconds or so, and it seemed as if she was having trouble getting an egg out, so I trooped back up to the house and Googled (I swear) "Chicken egg stuck". That's when I discovered that this is an actual condition called being "egg bound." I had no idea as none of our hens ever had trouble when they started laying (when, apparently, this is much more common). One website mentioned that if chickens are really cold this can be more common, and since the temperature here has been well below freezing, that might've been it. Unfortunately, I also discovered that being egg bound is a serious condition that often results in death. I don't think I could stand it if another chicken died this year, so I was willing to go to heroic lengths to help this one out. The "surefire cure" recommended on various websites was to give the chicken a warm bath. Now, that's easier said than done and since this is our fiestiest chicken, I had my doubts as to the feasibility of such an endeavor, but when I picked her up she came agreeably enough and we went up to the house and into the bathroom. Ten minutes in a warm bath didn't produce any eggs, but the chicken seemed like she was in a lot less distress at least. There were some funny moments as she looked at herself in the bathroom mirror, trying to figure out where the other chicken was. According to the chicken experts, I was also supposed to...um... lube up the "vent" area (they actually recommend KY jelly) to facilitate slipperiness and egg expulsion. Here's where I started to feel a bit James Herriot-ish, since I recall he always had a hand up some animal or another. But, being the urban farmwife that I now am, I gave it a try. Fortunately, I could feel the egg right there, so I had a hunch that she'd be okay. By this time it was getting dark and almost time for me to head to work. My husband didn't want to try carrying the chicken back down (I'm sure he was having flashbacks to the last time he tried to catch a chicken, an act that provided much amusement for the entire neighborhood). But she was far too wet to take out in such cold. The answer? A hair dryer. I never use one, so I had to dig around awhile to find it, but eventually we were blow-drying the chicken (oh I wish I had a photo of this), and could return her to the coop, warm and at least more comfortable. Within an hour, she'd laid the egg and all's well that ends well. The things that most impressed me from this little escapade were the sweet way that Dingbat (one of our hens) came and got my attention to go help her friend, and how sweet our fiesty little Hera was as I tried to help her. Also, my continuing education as a keeper of chickens and perhaps even Hairdresser to the Poultry World. The premise is this: take 1/3 acre of property, formerly covered with junk and invasive ivy, one gigantic leaf pile (10 large dump truck loads of leaves), spread leaves evenly over property, hopefully killing or at least weakening ivy and blackberries and enriching the soil. Some of this area will be our second garden, and some will just be fun areas for the kids to romp around in down by the creek, and maybe I'll plant a couple of fruit trees in the sunnier spots. I've been doing an hour or two a day on the leaf pile every day this week since the weather has been balmy. I'm starting to make at least a small dent in it, I've probably moved at least one to two dump truck loads by hand so far, and my hands have the callouses to prove it! 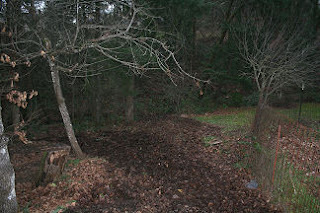 This photo is taken from the top of the leaf pile, showing the river of leaves flowing outward and down the slope. It reminds me a bit of Lava Butte, over by Bend, Oregon. From the top of the butte, you can see the lava flows spiraling outwards just as if they flowed out yesterday. When I get catalogs in the mail, I've learned that the absolute best thing for me to do with them is put them straight into the recycling bin (actually, the best is to keep trying to get off the mailing lists, but second best is recycling them). Otherwise, if I start leafing through them, I invariably see something that ten minutes ago I didn't know that I absolutely needed to have. It's the same reason I rarely go to malls, department stores, or big box stores. Who needs to see all that stuff you don't have and probably shouldn't buy? The kids, unfortunately, have become catalog addicts. Before these bits of mind-sucking consumerism can even make it from counter to recycling, they are flipping the pages relentlessly, only to pause momentarily to utter that chilling phrase: "I want that." The same thing happened when we were on vacation and we watched TV that you couldn't fast forward through the commercials. Every 15 minutes, a chorus of "I want that" would issue forth from the small beings on the hotel bed. Now, I'm not opposed to the kids getting things that they want and love. Like any unschooling parent, I support their inquisitiveness, their joy in play, and their need to learn what they like and don't like, what lasts and doesn't last, through their own experiences. As an environmentalist though, I have to admit that this is one of those places where values clash. The thought of buying more and more and more new Stuff, undoubtably manufactured in China from the cheapest possible, least-renewable materials by underpayed workers in sweatshop conditions, and then shipped thousands of oil-fueled miles across the ocean sets my treehugging teeth on edge. One way that I've been able to embrace these two halves of my value system is that we've given the kids their own money to spend. We don't in any way control their money, and they can use it to make a purchase of something they'll love and cherish and play with for years and years, or something that will fall apart the instant it's out of the box. Over the years, they have done some of each of those things. The kids do, however, ask my opinion, and they know full well my Scale of Toy Quality. On one end are toys with "Sticking Power": the ability to be enjoyed for a long time, the ability to keep engaging one's brain or heart or relationships. Toys that fall under here have been well-loved stuffed animals, Legos, games, puzzles, yo-yos, musical instruments, dolls, and more. On the other end of the scale from Sticking Power is CPC. For those who aren't offended by the occasional colorful word, that stands for Cheap Plastic Crap (or, since my kids abhor curse words, unlike their sailor-mouth mother, "Cheap Plastic Crud). CPC does nicely for short. We've all seen (and dreaded) these toys - they fall apart instantly, they have insufferably small pieces that get lost almost as quickly, or they simply have limited play power and are quickly tired of and relegated to the dregs of the toy bin with a couple of old thrift-store-purchased Happy Meal toys. Well, today was one of those Dreaded Days, the day when the Oriental Trading Company catalog (a.k.a. Penultimate Catalog of CPC) arrived. The kids leafed through it with the usual oohs and aahs over the five dozen rubber ducks with assorted accessories, and the flashing spiky plastic ball keychain thingamabobbies, but as time goes by, the oohs and aahs are often followed by "But I'm saving my money for that game I really want". It's nice to know that, even though we've never banned the kinds of toys that I personally abhor, they're able to find their way to their own understanding of what matters to them. That doesn't mean we'll never see another "made in China" label, but I think that the chances are ever-increasing that the objects that are brought into our house are things that the kids will love and cherish. Although An Inconvenient Truth came out awhile ago, it seems that the effect is still rippling out in impacts small and large. In several different conversations this week, people have mentioned the movie in the context of things they are doing differently. With the November elections just barely behind us, and the presidential contenders just starting to ramp up, it feels like the weather is finally changing across the USA - you can almost feel the wind blowing from another direction. Here's hoping it's a strong and steady wind, one that will bring real and lasting change. I sometimes think about all of the little things that we can do, things that are not so very difficult and seem like a drop in the bucket. But if every person chose to do them, the impact would be huge. We've seen this with changes that are already happening. Recycling is a frequently quoted example. It took awhile to get the ball rolling, but now enough people are doing it to make a real difference. If everyone took one car-free day a week, gas consumption and emissions would drop dramatically. Or made a commitment to buy one food locally that they now purchase from a regular store. Or turned their thermostat down two degrees, a barely noticeable amount, took one minute less in the shower, turned off lights they weren't using, installed compact flourescents or energy-saving blinds. - One car-free day a week (or more) in the winter, two or more in the summer. As we all make New Year's resolutions this time of year, I hope we are all thinking of not just goals for ourselves and our families, but for our planet and its diminishing resources as well.